There can be a misconception with choosing the right colour to paint your eaves. Often people group eaves with the fascia and sometimes the right colour can relate to the trim of your house but this is not necessarily always the case. Eaves, or soffits as they are sometimes referred to, often pose a problem when it comes to a colour choice. It is usually the very last colour decision to consider and often one that people don’t even realise they have to make. I explain to clients that the eaves are the external ceilings. However, as with an interior ceiling, if you get the tone wrong it can throw the entire scheme. With modern design and large alfresco areas, this colour choice is really very important so if you would like to find out more, I have a number of points to bear in mind in my guide to painting eaves. 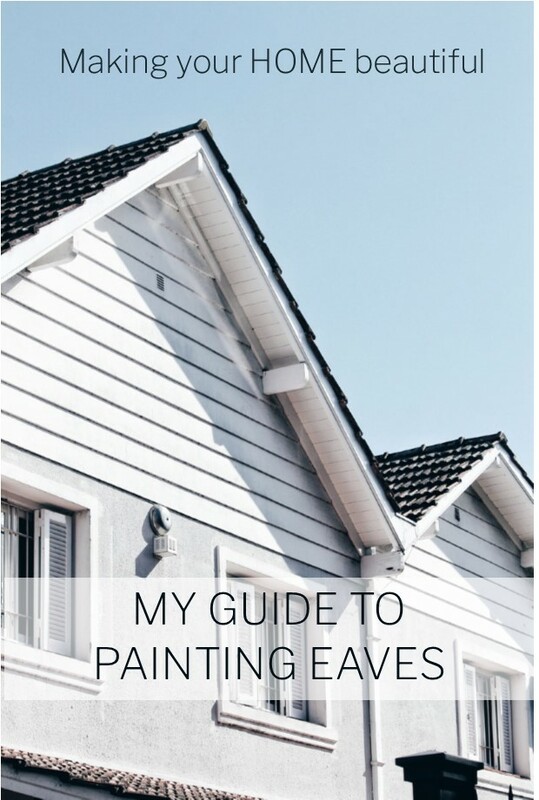 Choosing a colour and tone to paint your eaves is like choosing a colour for your interior ceiling and the main point that I tell clients is to remember that when a colour is horizontal, it is twice as dark as on a vertical wall. You can see this by getting a large sample of a wall colour – you can even see it with a white – and look at it straight on and then look up at it in a horizontal position. You can see quite clearly that it is darker. The rule of thumb for interiors is a full strength of a white on the wall and half on the ceiling to make it look the same or for more contrast, a quarter strength of the same white. 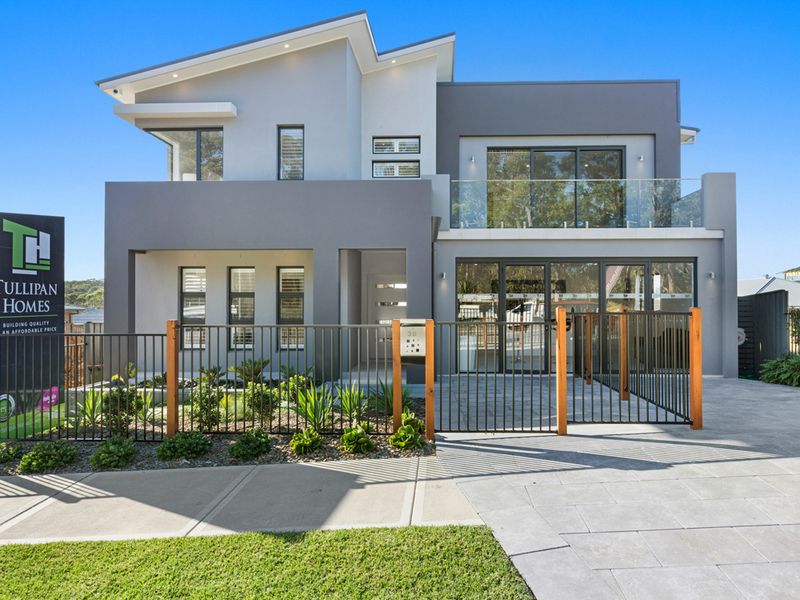 So this is quite straight forward for an exterior white – if you are painting the walls in Colorbond Surfmist, you can ask the paint shop to mix you a half strength for your eave colour. It gets a bit trickier though when you are selecting a darker neutral or grey for the walls or indeed if you are using a face brick with a dark trim. Again, consider this from the viewpoint of an interior scheme. If you have a darker wall you have possibly chosen some light white trim to go with it, either on the fascia/barge board or for the windows and architraves. You can use this white/off white as a reference point but rather than opting for a half strength as I would with an internal ceiling, I usually go with the full strength of the trim colour for the eaves. If you make the eave colour too light against your darker wall you end up with a bright white ribbon around the top of your house. Depending upon the aspect of the house – for example if it is on the high side of the street and you look up to it – this can be very disconcerting and can spoil the entire look. 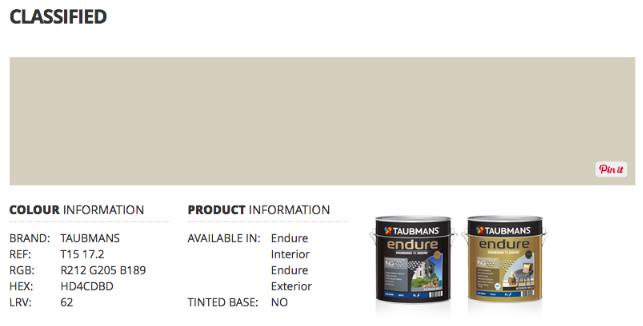 The three colours on this house are Taubmans Iron Age, Taubmans Grey Comfort and Taubmans Ash Brown. These colours are all from the same range at Taubmans and I selected a lighter option from the group for the eaves – Taubmans Classified. Although the eaves are nice and light and actually look white, Taubmans Classified is definitely not a white when you look at a sample of it. 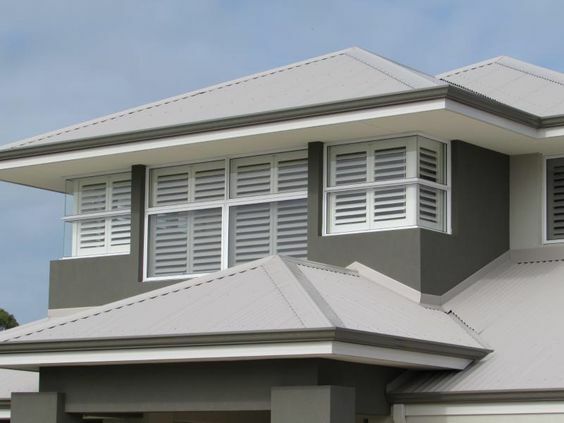 The house above has a light Colorbond Dune roof but the owner has added a nice dark gutter to tie in the render colour and then added a white Surfmist fascia and used this as a guide for the eave colour. The right colour for your eaves though does not have to relate to the trim/fascia colour of your house. For example you may have a house with a mid-tone neutral and a charcoal gutter and fascia. 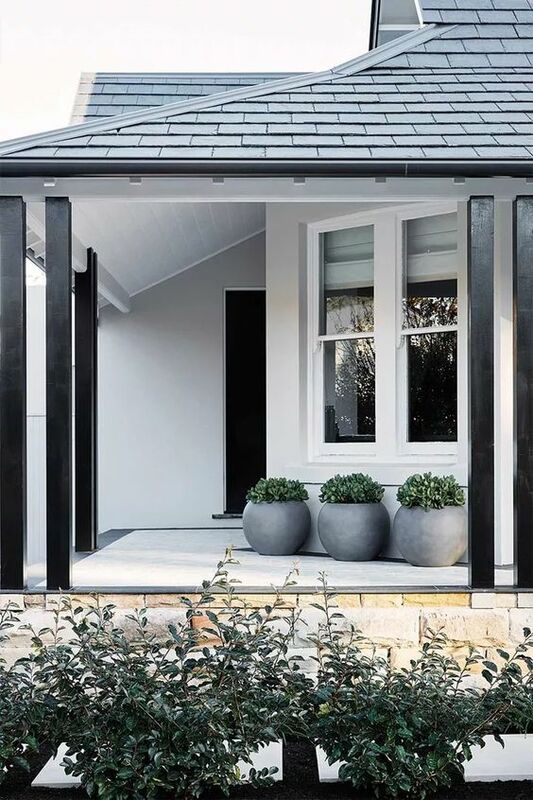 Most likely you will not want a charcoal eave so you need to select the wall colour first and then look at the relevant commercial colour Atlas/fan deck to see this colour as it gets a lot lighter. I tend to favour slightly darker eaves – my advice with exterior colour is that you often need to select one that is much darker than you originally think and this is the same with painting eaves. A beautiful exterior scheme can be spoilt with eaves that are too light. For the house below, I specified a mid grey for the walls and a light grey for the eaves. The painter was not happy! He said that the eaves would be too dark and that the client should opt for a white (just as many people and many painters like to just use a bright harsh ‘ceiling white’ for interior ceilings) but I think you can safely say that the eaves on the house below look like a white, it just doesn’t have the jarring quality of a brilliant white that would have spoilt this house. I am happy to say the client stuck with my choice. Therefore if you make a colour selection for your walls, take the time to find out what it is in its lightest version. If you still feel it is too dark you can ask for a half strength of the lightest version – remember to test it out first too so that you can see the overall effect. The paint store should be able to help you with this but if you are really stuck, a colour consultant would be able to help. You may also need some assistance if you have selected a face brick and you are using a dark gutter and fascia. You need to look at the brick tonings and match them to a paint colour and then see that in its lighter incarnation. I usually treat exposed timber rafters slightly differently as a large portion is in a vertical position and also joins directly to the fascia board and posts. I tend to just paint these the same colour (often a white) as the posts/balustrades/fascia etc. If you are using dark posts, fascia and balustrade then of course you can also paint the rafters in the same dark colour. This house above is a particular favourite of mine. 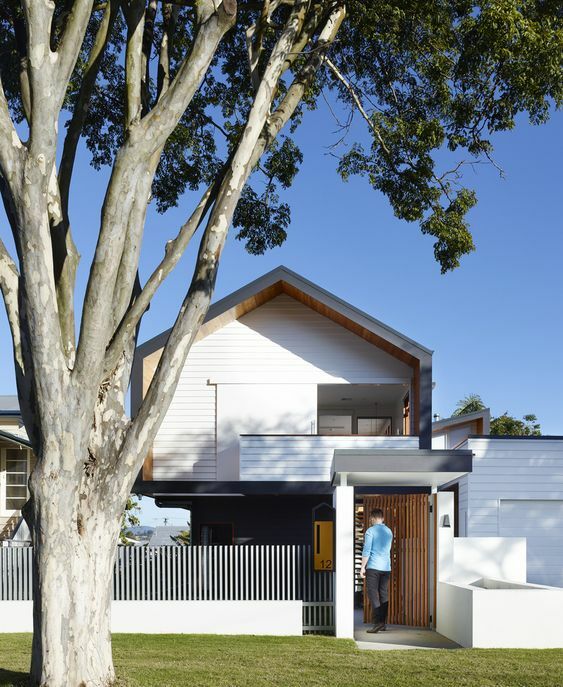 Designed by Catalano Architects in Boston, they have cleverly linked the lined eaves with the sophisticated grey trim colour for the house. I really like this effect. 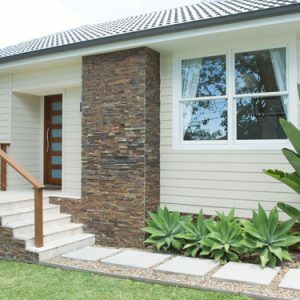 Eaves lined in timber are also very effective as again the darker eaves can make the house more appealing, so don’t automatically think that you have to paint them a bright white. 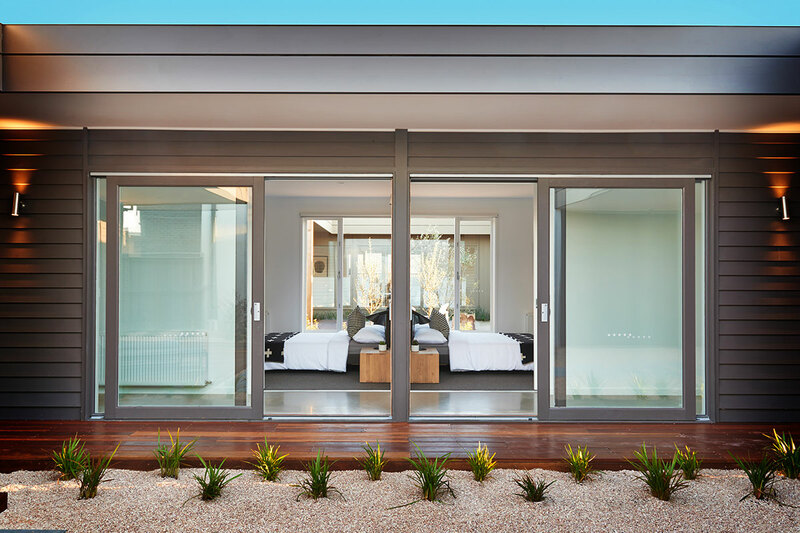 Many homes now are designed with large Alfresco areas that lead off of an indoor space with doors that open up completely and in this instance indoor/outdoor ceilings are almost as one. Your indoor ceiling may be very light. 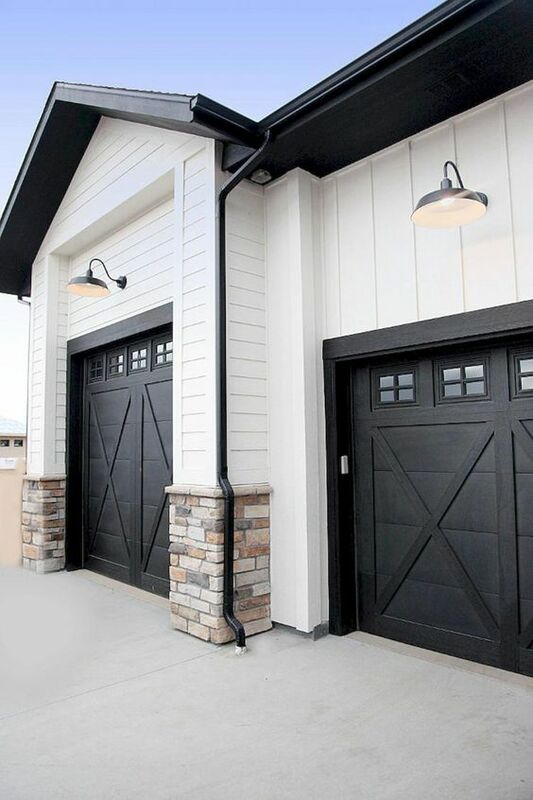 They could perhaps be something like Dulux Lexicon Quarter strength and unless you have opted for a very crisp white exterior it is unlikely that this light, bright white would work for exterior eaves. This is where you have to make a compromise. Assess the exterior colour and what you think to be the right eave colour and look at it against your indoor ceiling colour. You might need to adjust it to be a bit lighter so that you don’t completely spoil the flow but don’t be tempted to match it (unless you do have a very bright white house). 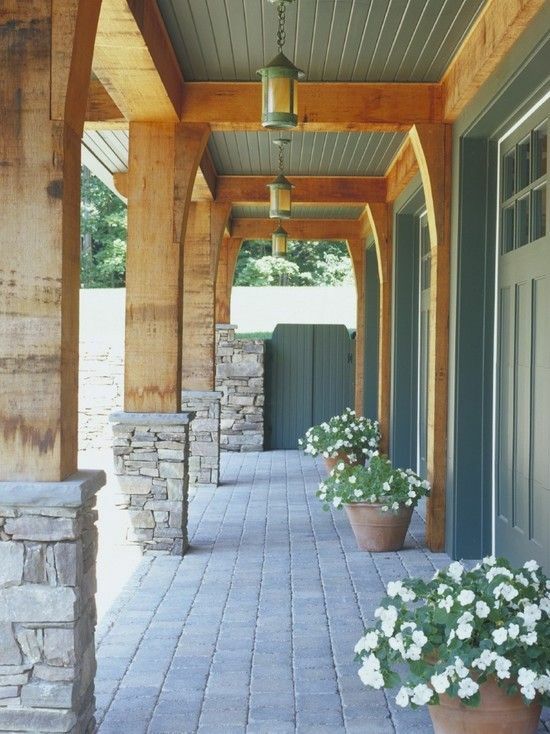 Always consider the overall look of the exterior – this is the most important element. To be honest how many people stare up at the ceiling of an indoor/outdoor room? 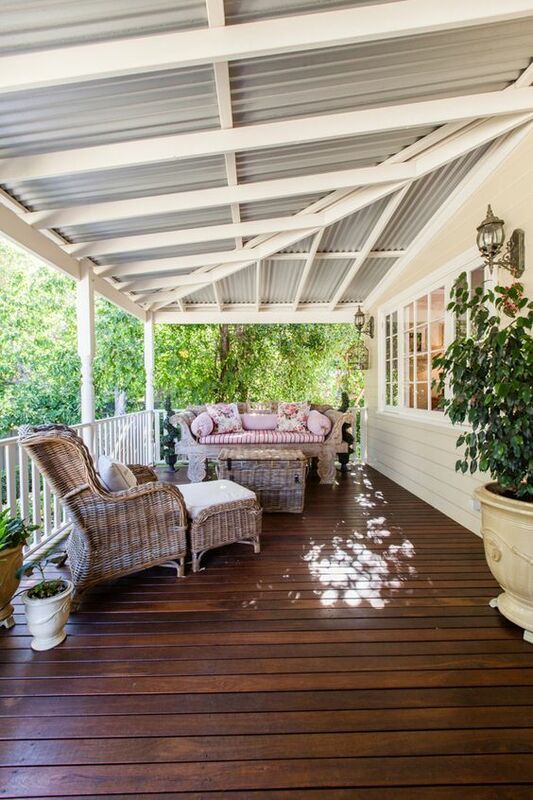 In these instances you can make a feature of the Alfresco ceiling – perhaps line it with cedar boards or simply install a shiplap finish in an off white. By creating a different substrate, you can then get away with a different colour and/or tone. 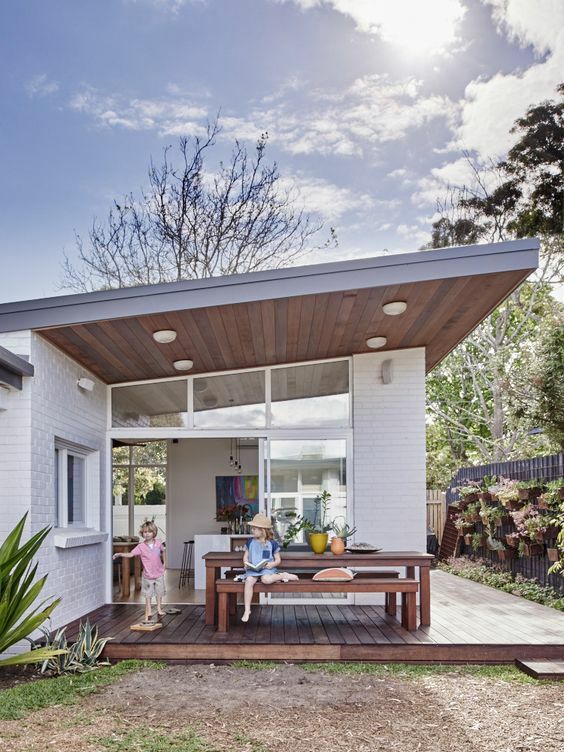 If your Alfresco space is self contained and doesn’t flow through to the main eaves of the house then you can easily treat this ceiling differently. Don’t forget that the eaves of a house are where the spiders make their homes too and if you have traditional rafters or rough hewn beams they can easily get very dusty. Despite your best efforts with a Turk’s head (if you can reach that high) eaves are often the first surface to get really dirty on an exterior. This alone should strengthen my case for slightly darker whites or neutrals here! A very enlightening article which has raised a few doubts in my mind. After seeing your Dulux Stepney rendered house, it makes me concerned that the Shale grey I have chosen as my render maybe too light. From memory Stepney is much darker than Colorbond Shale Grey. My house also gets full sun as it is north facing. Have I picked too light a colour for render? Secondly, I have chosen Lexicon 1/4 for my eaves and I will have a Windspray roof and fascia. My first floor is cladded in Terrace White. Shale grey is the remainder of the house that will be rendered. Have I picked the right colour combinations especially regarding the eaves? I should mention my windows will be pearl white. Also can you recommend a nice light grey render in case I don’t go with Shale grey? Stepney may look too dark in the shade. What a wonderful read, still a little confused on what colour to paint my eaves as I am building a new home I have a very dark brick ( metallix graphite ) with night sky roof/ guttering basalt fasia was thinking to keep the basalt colour under the eaves but I am concerned as I have an under roof alfresco area and a portico at the front door which I think might close in the roof space in both these areas do you have any suggestion on what I should do here? Thanks Samantha I will have a look at that colour, I was thinking that maybe the basalt would be ok if I have the colour mixed into a 3rd strength colour so it wasn’t so dark under the alfresco as the roof is set up not level with the eaves. But I do like the colour you have suggested I will grab a sample pot of this and paint some timber and have a look next to everything. I came across your article whilst trying to research external painting guidelines and found it to be very informative but I am still lacking the confidence to decide on a colour palate moving forward. 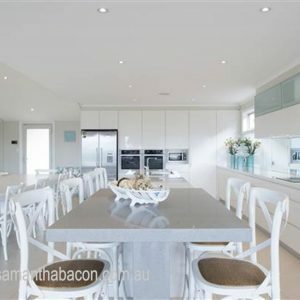 I am renovating a beachside property and I have selected Sycon Stria vertical cladding for the outside lining which I will be painting in Colorbond Monument which is dark charcoal. The windows are black aluminium. I am trying to keep the house quite modern and my painter is quite insistent that my eave sheets and window trims be painted white which I am quite adamant I do not want to do. 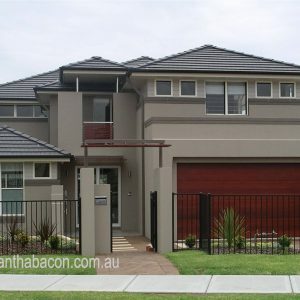 I was wondering what your thoughts would be on using a lighter colour for the fascia (such as colorbond Basalt) and window trims and then 1/4 strength for eavesheets)? I will also be replacing all the gutters and downpipes. Alternatively I could go black to match the windows and then a mid grey for the eaves. Any advice would be very much appreciated. I’ve found your article really interesting!! I’m wondeting if you can help me out with eave colours- we are repainting our weatherboard: exterior walls- dulux tranquil retrial, gutters and door- monument, windows- Dulux Lexicon Half Strength. I can’t decide whether the eaves should be grey or white but don’t want them too dark (monument) or glaring white. Any help would be appreciated! Thanks for generously sharing your wealth of colour knowledge!!! Our house has a terracotta roof (weatherboard, double story, Edwardian style) which is stumping me when it comes to colour choice. Looking at monument for fascia, Haymes sense or minimalist 6 for weatherboards with white windows. Don’t want that bluish colour you often see with grays, but something rich. Is a gray palate the way to go or am I better going something with more brown undertones??? Many thanks! 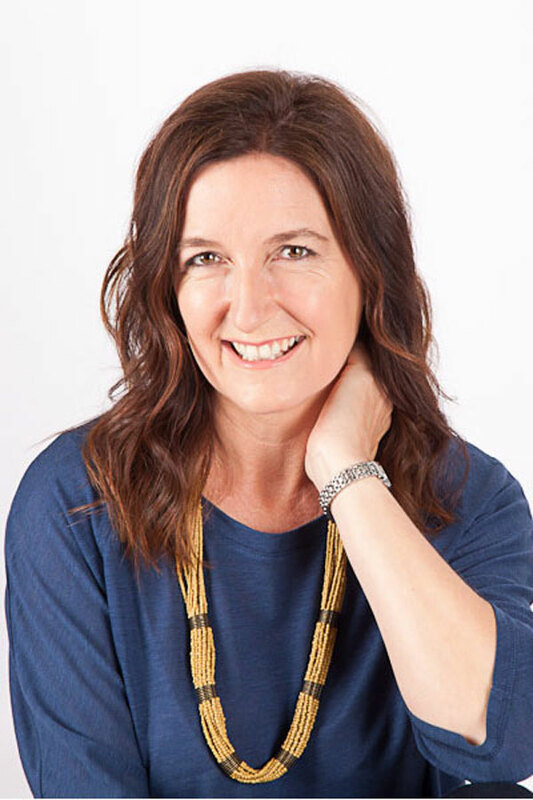 This is a brilliant article and so helpful!! So generous of you to be commenting still on it too. We have a crusty terracotta roof on our weatherboard we can’t afford to change just yet. Our extension will have a Windspray Roof. The weather boards will be Haymes Putty Grey (a shade down from Dulux Grey Pebble to my eyes) which is a dark white/super pale Greige. I hope to change to Windspray Colorbond on the front roof also in the future. I’m currently making the selections for my house. I have purchased multiple pots of grey paint. My aim is to pick a grey that doesn’t throw another colour. I have narrowed it down to Shale grey. I plan to go surfmist roof, gutters and fascia. The building company wants to paint the eaves, soffit and poles in surfmist. Is this a good suggestion? My original thoughts were to go a white but after reading your article I’m unsure. We are also in a flood zone being close to the beach. We have to build up with concrete. 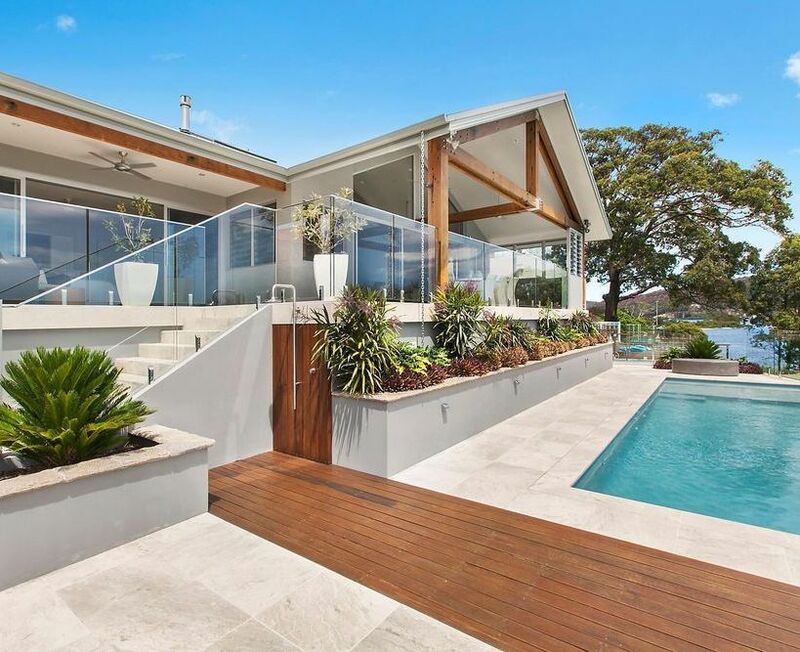 On the exposed concrete, would you just suggest to paint it the same colour as the house? We have horizontal ironsand corrugate cladding, ironsand roof and windows – your suggestion for eaves please? Thanks – I agree that darker would probably be better. Thanks for your help. My main query is re the colour for fascias and gutters…we are thinking either Monument, or another rich, warm dark grey that would suit. 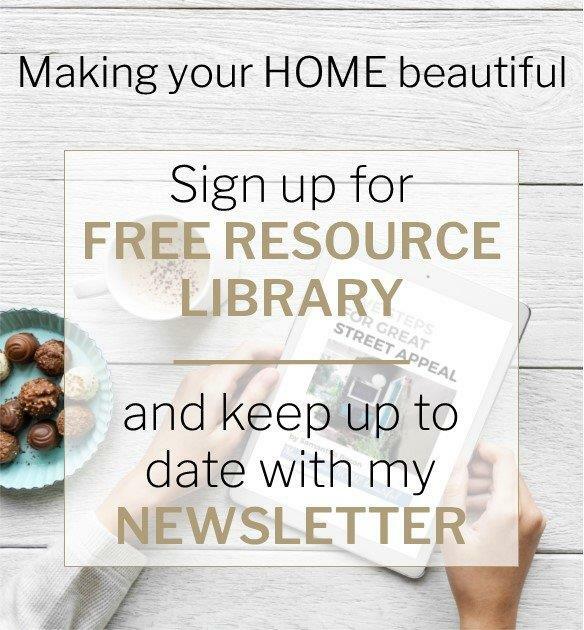 Loved reading the article and all the great advice you’ve offered. 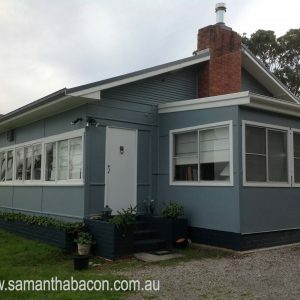 We live in a single story brick veneer cottage currently white brick with grey/brown concrete tiles. Should we stick with the white bricks and have a monument roof? Or white bricks and a surfmist roof? Or finally dark grey walls maybe monument with white windows and surfmist roof. The garage door is currently surfmist. The windows are white with small squares that go all the way to the ground. I am tossing between ghosting or grey pebble for the walls ? They seem similar ??? I am hopeful that lexicon quarter for the eaves andvwindows and oolong for the gutters and gables will do the trick . Hell this is hard !!! Thank you for your article, a great read. I live at Perth, Western Australia. My home is almost 40 years old, rendered, with a dark grey/brown clay tiled roof and gutters and facias in Monument. I am thinking about painting the exterior walls in Terrace White and the eaves in a similar tone. My question is what brand of paint do you recommend and not sure whether to use matt or low sheen? We are painting our weatherboard home Dulux Calf Skin and the painter is suggesting Lexicon for the trims (which we want to look classic white). Our gutters are currently Woodland Grey but I’m thinking to drop them down to Wallaby (lighter). What should my eaves be? Any other suggestions? In the back of our house are all windows, attached to a veranda that has surfmist ceiling and guttering (that is seen from under the veranda). Now I’m wondering if my eaves should be surfmist? It’s all so confusing. I know the colours I like (above) but the variations due your head in.